I keep seeing comments on social media about people trying to get high from eating raw flower. It’s time to settle this once and for all. 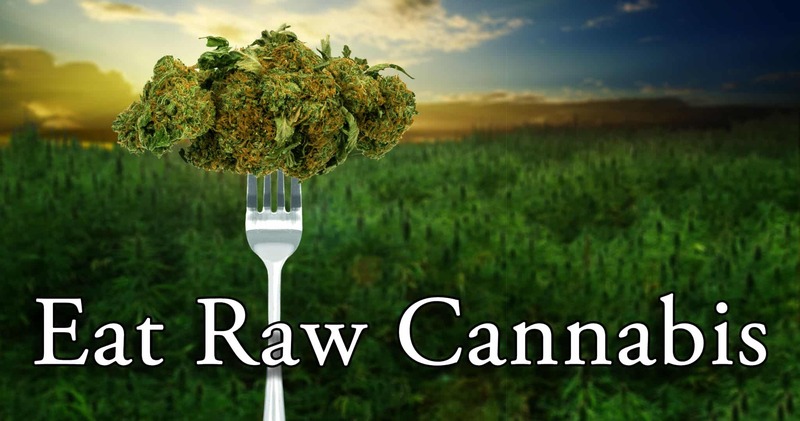 You cannot get high from eating raw flower, so you should probably stop trying to. I’ve been told that this is something everyone does once. Is that really the case? I never did. It’s like I knew eating raw flower wasn’t going to get me high. I used to eat my weed stems, but that was because I liked the taste. I never knew anyone who ate raw flower to get high, though perhaps they had and they weren’t willing to admit it? There’s a reason why simply eating your weed will not get you high: decarboxylation. For those of you who slept through biology, decarboxylation is simply the removal of a carboxyl group from an organic compound, in this case THCa (tetrahydrocannabinolic acid). The removal of that carboxyl group allows the THCa to become good ol’ THC, the cannabinoid that allows us to get high. This is why making edibles is not as simple as mixing your leftover shake and some brownie mix together. The THCa has to go through the entire process, or it won’t do you much good. If you want to eat your weed, you have to decarboxylate it first. This can be done by throwing it in the oven at 240 degrees for 40 minutes, while stirring every ten minutes. Anything above that will only succeed in torching your weed. There is a reason to eat raw flower, however. There are several reasons in fact. As it turns out, it’s quite healthy for you. Cannabis flower contains tons of nutrients, not the least of which being THCa and CBDa which interact with the cannabinoids in your body. Eating raw flower has a number of nutritional, as well as therapeutic benefits, and it tastes way better than raw kale! The good thing about raw flower not getting you high is that you can consume as much of it as you want. It’s not uncommon for healthy minded people to juice raw cannabis, along with all their other veggies. Now is your chance to eat more leafy greens! So to sum up, you should eat flower, but not if you want to get high. Just stick to smoking it. Any questions? Class dismissed! Have you eaten raw flower? Did you do it to get high or for health? Share in the comments!